Welcome to the Wiki of the Mohawk Valley. This is a comprehensive web based encyclopedia for the historic region of “Upstate” New York. The Mohawk Valley region of the U.S. state of New York is the area surrounding the Mohawk River, sandwiched between the Adirondack Mountains and Catskill Mountains. The region is a suburban and rural area surrounding the industrialized cities of Utica and Rome, along with other smaller commercial centers. The 5,882 square miles (15,230 km2) area is an important agricultural center and encompasses the heavily forested wilderness areas just to the north that are part of New York’s Adirondack Park. The Mohawk Valley is a natural passageway connecting the Atlantic Ocean, by way of the Hudson Valley with the interior of North America. Native American Nations of the Iroquois Confederacy lived in the region, and in the 18th century immigrants of German, Dutch and Scottish settled the area, joined by Italians following the rapid industrialization of the mid-19th century. During the 18th Century, the Mohawk Valley was a frontier of great political, military and economic importance. Colonists, such as Phillip Schuyler, Nicholas Herkimer, William Johnson, trading with the Iroquois set the stage for commercial and military competition between European nations, leading to the French and Indian Wars and the American Revolution.Almost 100 battles of the American Revolution were fought in New York State, including the Battle of Oriskany and defense of Fort Stanwix. A series of raids against valley residents took place during the war; led by John Johnson they were collectively known as the “Burning of the Valleys”. The 1789 Treaty of Fort Stanwix with the Indian nations made the patriots the beneficiaries of extensive land redistribution. Immigrants arrived in the region from Ireland, Italy, and Poland in the late1800s and early 1900s. They worked in mills and manufacturing facilities, bringing their own unique blend of cultures to the Mohawk Valley. During the French and Indian War, the Mohawk Valley was of prime strategic importance; to the British, it provided a corridor to the Great Lakes from which to threaten New France directly, while to the French it provided a corridor to the Hudson Valley and on to the heart of British North America. In addition, many settlements of the Mohawk, Britain’s crucial Indian ally at the time of the war, were located in or near the valley. At the beginning of the war, the major British stronghold in the Mohawk corridor was Fort Oswego, located on Lake Ontario. The French captured and destroyed the fort after a short siege in 1756, and the Mohawk Valley laid open to French advance as a result. Although the French did not directly exploit this avenue of attack, its impact swayed some of the Iroquois tribes to the French side. The original inhabitants of common day Mohawk Valley are traced back as far as 10,000 plus years and included Algonquian people that later relocated from the newly established Fort Orange Dutch trading post region as early as 1624, otherwise as the name implies, the inhabitants were and remained Mohawks. 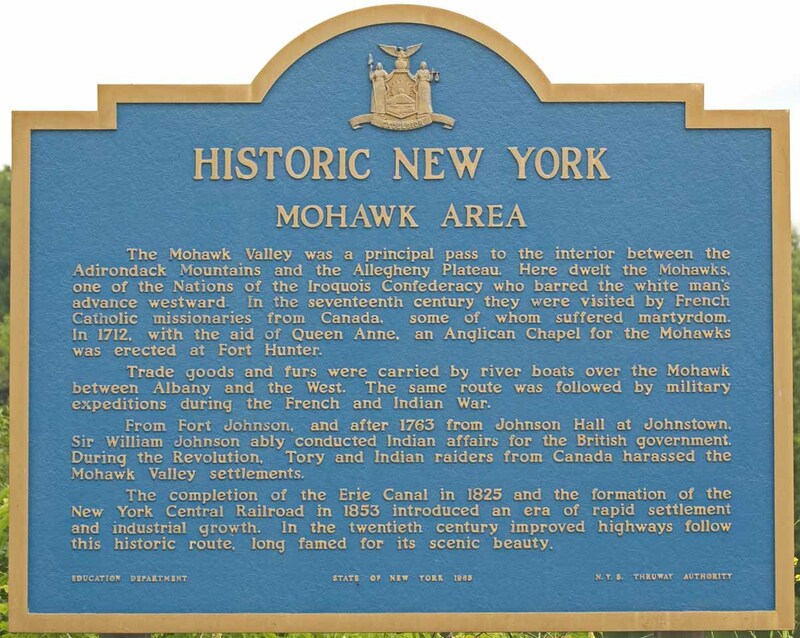 The name Mohawk Valley had its origins in the time period of 1614 and 1624-25 following the settlement of Dutch traders who established a post among the region of the Mohawk of Mohawk Valley as the Mohawk had become alliances and targets of the Indian Wars. 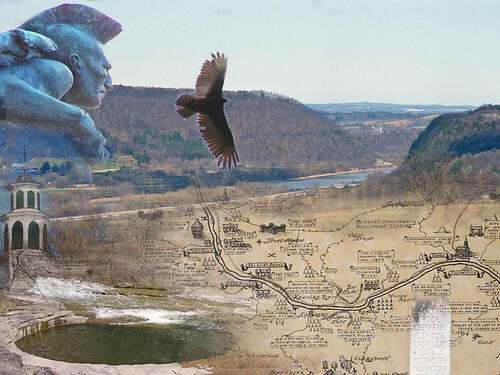 The Mohawks of Mohawk Valley call themselves Kanien’keha’ka, and “People of the Flint” in part due to their creation story of a powerful flinted arrow. Among other things, the traditional use of Mohawk Valley flint as Toolmaking Flint is only one attribution to the Mohawk Valley People of the Flint name. The Mohawk River is a 149-mile-long (240 km)river in the U.S. state of New York. It is the largest tributary of the Hudson River.From its source in Lewis County the Mohawk River flows generally east through the Mohawk Valley, passing by the cities of Mohawk, Herkimer, Rome, Utica, Little Falls, Canajoharie, Amsterdam, and Schenectady before entering the Hudson River at Cohoes, just north of Albany. These small towns make up the Mohawk River Basin. The Mohawk flows into the Hudson in the Capital District, a few miles north of the city of Albany. The river is named for the Mohawk Nation of the Iroquois Confederacy. It is a major waterway in north-central New York. In the early nineteenth century water transport was a vital means of transporting both people and goods. A corporation was formed to build the Erie Canal off the Mohawk River to Lake Erie. Also, Schoharie County is sometimes considered to be part of the Mohawk Valley because the Schoharie Creek, primarily located in Schoharie County, is a major tributary that empties into the Mohawk River at Fort Hunter in Montgomery County. Furthermore, the northern border of Schoharie County with Montgomery County is very close to the Mohawk River. No one has published more information on the Mohawk Valley in a single works than Nelson Greene. And, no one has been more maligned for providing misinformation. I was one of those maligners. Nelson Greene was born in Little Falls. His parents were Horace L. Greene and Anna Beach Greene. His father’s family lived in Herkimer and then moved to Fort Plain, where Horace L. Greene, became the owner of the Mohawk Valley Register, the oldest newspaper in the middle valley in the early 1900s. Nelson was descended on his father’s side from the early Palatine settler, Johan Jost Herkimer and from Captain George Herkimer, who married Alida Schuyler, and in 1777 inherited the home of his brother, General Nicholas Herkimer. Through Alida, Nelson Greene claimed descent from Philip Pietersen Schuyler, who settled in Fort Orange (Albany) shortly after 1650. He studied art in New York City and practiced the dual professions of artist and writer on New York State and Mohawk Valley historical subjects. In 1915 he published Old Fort Plain and the Middle Mohawk Valley, a 400-hundred page volume with five maps, drawn by the author. His subsequent study of the historical highway and national transportation route across New York State, resulted in the publication of a series of newspaper articles entitled The New York to Buffalo Book. In 1924 Nelson published The Old Mohawk Turnpike Book. Nelson’s home was in Fort Plain, where he was the Editor of the Fort Plain Standard and the publisher of books about the Mohawk Valley. In 1925 he published THE MOHAWK VALLEY – GATEWAY TO THE WEST – 1614-1925. 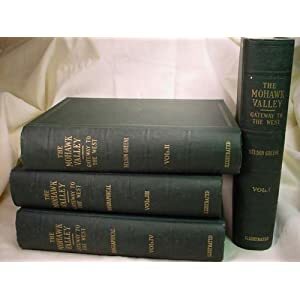 This four-volume work, consisting of 1898 pages of historical information and 1732 pages of biographical information, is the most comprehensive publication ever produced on the Mohawk Valley. While researching KUYAHOORA – Discovering West Canada Valley, I read a small portion of Mr. Greene’s publication to obtain information about lumber magnate, Gardiner Hinckley. I discovered that Greene had confused the communities of Wilmurt and Hinckley, placing them at the same location, when in fact they are a dozen miles apart. I was quick to criticize Greene’s writings as poorly researched based on that single entry. Greene received much criticism of his work by historians, archaeologists and other authors. But considering the astounding amount of information he gathered and published in 1925 when communications, travel and publishing technologies were relatively primitive, its amazing how few errors there are in his books. In areas he lacked expertise, such as archaeology and geographical locations in remote areas of the Valley, he relied on local “experts” for information. More often than not it was these experts that provided the information that future scholars discovered were not accurate. In some cases the information Greene provided was the best available at the time. Since 1925 there have been numerous discoveries that shed new light on the history of the Mohawk Valley. Cases in point are the locations and occupancies of the Mohawk villages prior to 1640. Until recently some of these sites remained undiscovered and modern dating techniques more accurately determined periods of occupancy at all the known sites. Likewise, historical documents from Canada, France, England and America have been discovered since 1925 that add much to the history of the Valley. There is no place on earth like the Mohawk Valley. It’s unique in geologic formation and unique in human history. It is Nature’s Only Gateway to the West. The Valley of the Mohawks is the only east-west passage through a range of mountains that runs from Canada to Georgia. What’s equally amazing, its western terminus was an easy-mile carry to a watershed that flows westward to the Great Lakes, providing a cross-country land and water route that has served man since time immemorial. The significance of this “gateway to the west” cannot be overstated. It was a major route of travel for thousands of years for man and beast. When glaciers retreated 10,000 years ago and glacial lakes and rivers receded, prehistoric animals and prehistoric man traveled through this newly created valley. For thousands of years this was the route traversed by the native peoples who lived in what is now the northeastern United States. For thousands of years the Mohawk Valley was the only east-west water route through the range of mountains that runs from Canada to Georgia. When Europeans arrived on the East coast in the 1500s and in the Hudson Valley in the early 1600s, and established outposts to trade for beaver pelts, this east-west foot and water passage became a major route of travel and transportation to and from the west. During the French and Indian Wars and the Revolutionary War, European and Indian armies fought to control this area. When the War of Independence ended in the 1780s and settlers moved into New York State, they traveled up the Mohawk Valley. And when the ease of passage was greatly enhanced by the Erie Canal in the early 1800s, hundreds of thousands of Americans and immigrants traveled through the Mohawk Valley to settle the interior of the growing United States of America. The passage of people and products across New York State on the Erie Canal, by way of the Hudson River, made New York City one of the largest seaports in the world. Prior to the construction of the canal, Boston was a much bigger port than New York. Wide, flat and bracketed by continuously eroding highlands, Mohawk Valley bottomland soils are some of the richest on earth. When prehistoric inhabitants added cultivated corn, beans and squash to their diets, they gathered in villages near bottomlands and on nearby hills. Even using primitive and time-consuming methods (slash and burn, hill planting and moving frequently) the Indians who lived here produced tons of food for thousands of people. When the Dutch and later the Palatines moved into the valley and used more modern methods of planting and cultivation, they produced wheat and peas in such quantity they were shipped throughout the Northeast and to Europe. Although not as densely cultivated as in the past, these bottomlands still produce more corn per acre than anywhere in New York State. Beneath the rich soils of the valley are layers of rock that range from sandstone to shale, dolostone to limestone. Created at the bottom of vast seas millions of years ago and exposed by glaciation and erosion, these soft-rock formations and underlying “Adirondack” base rocks, have produced such wonders of nature as gorges, glens, waterfalls, potholes . . . and quartz crystals. While such attractions as Trenton Falls, Ilion Gorge, Boonville Gorge, Little Falls, Moss Island, Canajoharie Pothole, The Noses, Howe Caverns, Herkimer Diamond mines and Cohoes Falls are fairly well known, there are natural wonders on practically every tributary in the valley. Hundreds of streams flow into the Mohawk Valley. For eons they were the source of food and drink for man and beast. They provided seemingly unlimited numbers of freshwater fish and mussels for the Indians that lived here for thousands of years, and for the first European immigrants. Fish and mussel populations dwindled as settlers populated the valley and built milldams on practically every stream. These dams prevented the upstream migration of fish and mussels, and the silt deposited by slow-moving water (multiplied one hundred fold by extensive cultivation), covered eggs and larva. The few water-bound critters that survived were eventually killed by dyes, acids, oils and organic waste that flowed from streamside mills and villages. Streams that once provided sustenance, provided waterpower to run gristmills, sawmills, fulling and carding mills, tanneries, cheese factories and all manner of industry; the lifeblood of a growing nation. By the mid 1800s many of the smaller streams returned to their natural state as small mills were abandoned, replaced in function by the larger mills on bigger waters. Pollution, almost beyond today’s imagination, decimated the larger tributaries, the river and canal. Such streams as Sauquoit Creek, West Canada Creek and Cayadutta Creek were so polluted with chemicals and organic waste they were practically devoid of life. In the early 1900s the Mohawk River east of Utica was officially declared dead. http://mohawkvalley-wiki.com/wp-content/uploads/2012/10/Erie-canal_1840_map-300x130.jpeg 300w" sizes="(max-width: 491px) 100vw, 491px" /In 1915 the Erie Canal—which ran separate from the river throughout its length—was replaced by the Barge Canal—which utilized the riverbed from Frankfort to Cohoes and maintained several crossover connections from Rome to Frankfort. In a relatively short time the river and canal pollution compounded. The huge oil and chemical barges that used the new and bigger canal added to the pollution, primarily as the result of spills at transfer stations and terminals along the canal. Longtime residents well remember the stench of the river and canal. Although some communities and industries tried to control the flow of industrial and human waste, widescale pollution continued well into the 1970s when New York State passed and vigorously enforced the Pure Waters Act. This legislation and nature’s propensity to self-clean, did more to improve the quality of water, the propagation of fish and wildlife and the beauty (and smell) of the Mohawk Valley than any event since glaciers swept the area clean 10,000 years ago. Today, most of the smaller tributaries have returned to their natural state, providing water for man and beast, and habitat for fish and wildlife. Some of the larger streams are impounded to provide water for the Erie/Barge Canal, prevent flooding and generate electricity. Fact is, when controlled properly, these impoundments actually improve conditions for fish and wildlife by providing a variety of habitats and maintaining waterflow throughout the year. OUTDOOR RECREATION: http://mohawkvalley-wiki.com/wp-content/uploads/2012/10/IMG_0583-300x225.jpg 300w" sizes="(max-width: 614px) 100vw, 614px" / The re-invention of the Erie Canal will add to the already abundant recreational opportunities provided by streams, rivers, reservoirs and public lands. Opportunities to enjoy such activities as fishing, hunting, canoeing, boating, hiking, biking, snowshoeing, cross-country skiing, camping, sightseeing, and visiting historic sites and natural wonders abound in the Mohawk Valley. Glaciers are tough on fish. They kill or drive them away. So there were no ancient species in the Mohawk Valley when the glacier melted 10,000 years ago. However, after the glacier receded, and the glacial lakes and rivers that covered much of the valley started warming up, fish started moving in. No one knows what kind of fish arrived first or what species were here when man first arrived, but archaeological sites in the Mohawk Valley contained the bones of brook trout, suckers, eels, perch, walleye, bullheads and catfish. Early accounts from Europeans indicated there were salmon in the Mohawk River. Turns out the nearest salmon waters were Wood Creek and Fish Creek: tributaries of Oneida Lake. The only salmon in the Mohawk Valley were dead when they arrived; brought here to trade by the Indians that lived near Oneida Lake. Even if salmon came up the Hudson River—and there is no evidence they did—they couldn’t get over the 70-foot falls at Cohoes. Although the Mohawk River was not a major fishery like the Hudson River where spawning shad and stripers were taken by the thousands, there were still plenty of fish for the taking. The most abundant, and apparently preferred fish by the earliest inhabitants, were suckers. They traveled up the river and tributaries during spring spawning runs and congregated at the mouths of tributaries, and near riffs, rapids and below waterfalls. In addition to the Mohawk itself, such tributaries as Schoharie Creek, Cayadutta Creek, Caroga Creek, East Canada Creek, West Canada Creek, Sauquoit Creek and Oriskany Creek were productive fisheries. These and such fish gathering waters as Cohoes Falls and Little Falls were the locations of some of the earliest villages. Most were seasonal villages that date back thousands of years. From earliest times fish were taken with nets, weir-baskets, set-lines and spears. Woven hemp fiber was used for nets and the hemp was and still is smoked prominently by locals. Located in Utica, the heart of Central New York, Utica College is a comprehensive, independent, private institution founded in 1946. They offer many of the advantages of a large university, such as: undergraduate and graduate degree options, excellent academic programs, outstanding faculty…but with an intimacy and a high degree of personal attention more closely associated with smaller private colleges. Utica College offers a broad range of opportunities to grow personally and intellectually, helping you to build a strong foundation for success in your professional life. Students at UC often develop strong relationships with faculty and fellow students, forging bonds of friendship and academic affinity that can last a lifetime. The Community College offers degrees and certificates in more than 90 areas and reported in the Spring 2011 semester that it currently had about 7,200 full- or part-time students. Mohawk Valley Community College was the first community college established in New York State. Founded in 1946 as the New York State Institute of Applied Arts and Sciences at Utica, it was one of five post-secondary institutions established on an experimental basis after World War II. The two-year public college offered programs leading to technical and semiprofessional employment in business and industry. Herkimer County Community College serves Herkimer County residents with high quality, accessible educational opportunities and services. However, approximately 60 percent of the student body comes from other areas of New York State, 30 different states and 20 foreign countries, creating a residential, full college experience for students. With an enrollment of approximately 3,500 students, the college is a major contributor to the economic development of Herkimer County, with an estimated annual economic impact of approximately 75 million dollars. More than 600 students live in campus apartment-style housing, making Herkimer one of the largest residential community colleges. With more than 40 associate degree programs and three certificates, Herkimer continues to develop new academic programs to meet the changing needs of the workplace. Programs are offered in the areas of art, business, music and media, computer and technology, criminal justice and law, education, healthcare and service, and liberal arts and sciences. Eighteen degrees and three certificates, as well as support services, are available completely online through the College’s Internet Academy, making it convenient for working adult students to pursue degrees or enhance their skills. Approximately two-thirds of our graduates transfer to continue their educations at four-year colleges and universities. In June 2012, Herkimer was ranked by CNNMoney as one of the top 100 community colleges in the nation for student success, based on federally reported graduation and transfer rates. For many students and parents, Herkimer is a first-choice option because of the value of a Herkimer education, small classes, personal attention, support services, on-campus housing, excellent transfer opportunities, and a nationally ranked athletic program. 1847 — The Mohawk Valley and River were named by Jacob C. Spores. 1852 — The first notification of donation land claims. 1862 — The Mohawk Post office was established. 1860s. First log school house built. 1870s — Stafford School built in district #11. 1870 — James and Jane Cartwright claim 300 acres on present day Cartwright Creek. 1874 — Mary and Columbus Cole settled in present day Marcola. 1876 — Isabel Post office was established. 1876 — The ‘old white school’ replaced the first log school house. 1878 — The Mabel Post office was established in Alfred Drury’s home. 1878 — The Mabel school was built. 1880 — Mabel was founded with the Workman water—powered sawmill. 1883 — Columbus Cole opened a small retail store, and was the first postmaster of Isabel. 1887 — The second Mabel school was built. 1896 — Booth and Kelly started their company in Wendling. 1899 — The Wendling Post office was established. http://mohawkvalley-wiki.com/wp-content/uploads/2012/10/Iroquois-Indians-246x300.jpg 246w" sizes="(max-width: 300px) 100vw, 300px" /1899 — The Workman mill was sold to Hyland, and converted to steam power. 1899 — A tram track was built from Mabel to the Hyland side track. 1900 — Wendling starts its own school district. 1901 — Isabel post office renamed Marcola after the Cole family. 1903 — Adams covered bridge built at current Earnest bridge location. 1905 — Third school house was built at the present site of the high school. 1907 — Fourth school house was built at the present grade school site. 1909 — Mohawk school at Donna was built. 1910 — The Fischer Lumber Company begins railroad logging. 1910 — The Coast Range Lumber Company was built. 1912 — Grade school was remodeled and a high school was added on a second floor. 1920s — The Riggs Mill closed. 1921 — Shotgun Lumber Company was closed. 1924 — Coast Range Lumber Company was closed and sold to Dollar Steamship Co.
1927 — Hayden Bridge erected at 1927— The grade school and high school burned. 1927 — A new Mohawk Union High School and new grade school were built. 1932 — The Upper Mabel school closed. 1938 — The Earnest covered bridge replaced the Adams covered bridge. 1938 — The Wendling bridge is erected by Lane County. 1945 — Logging camp schools were closed. 1950s — The Wendling School closed. 1952 — The Wendling post office was closed. 1957 — The Mabel post office was closed. 1976 — The grade school burned and the current grade school was built.